Sermon on Ephesians 2:11-22 offered to the people of the Church of the Heavenly Rest on Sunday, July 22, 2012. In June of 1987, President Ronald Reagan uttered perhaps the most famous words of his presidency. 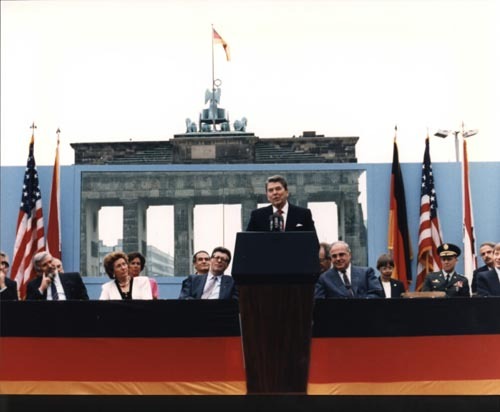 Standing in front of the Brandenburg Gate in Berlin, the president issued a stirring challenge to Mikhail Gorbachev, the General Secretary of the Soviet Union. Reagan’s charge came in the midst of unprecedented reforms in the USSR. During his tenure, Gorbachev had endeavored to change the Soviet Union’s image, highlighting the importance of “openness” and “restructuring.” He dismantled many of secretive political organizations and encouraged the growth of democratic reforms. Meanwhile, the Soviet Union was collapsing under the weight of an economy whose sole focus was the military. It was relatively clear that the Soviet Union would not exist for much longer. Whatever the reason for the Soviet Union’s eventual collapse, however, millions of Americans will forever associate it with the Gipper’s famous ultimatum: “Mr. Gorbachev, tear down this wall.” The Berlin Wall was a potent symbol of the intractable conflict between the United States and the Soviet Union. 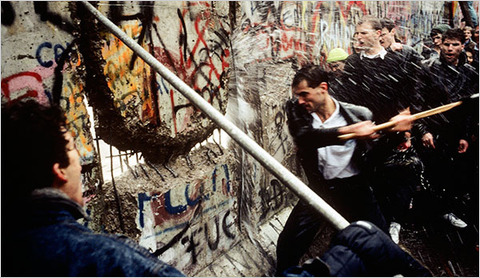 Indeed, when the Berlin Wall finally tumbled down in November of 1989, it was a moment of international jubilation. The Iron Curtain had finally been lifted, and citizens of East and West Berlin joined together to celebrate their newfound unity. 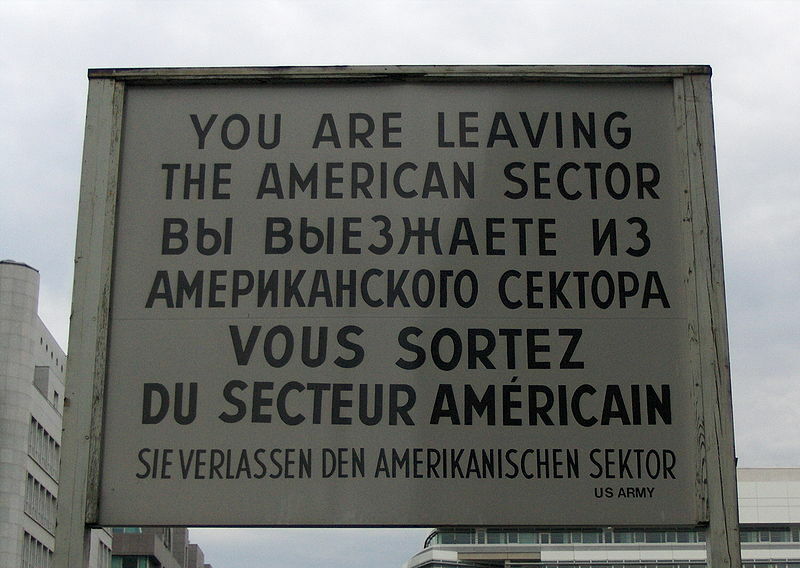 Since 1961, the Berlin Wall had been an icon of the hostility that existed between the United States and the Soviet Union, between the countries of NATO and those of the Warsaw Pact, between East and West. For almost fifty years, the world had been torn and divided along these lines; on both sides, the sense was “if you’re not with us, you’re against us.” The collapse of the Berlin Wall, in other words, did not simply represent a new era for Germany’s capital, it represented the dawn of a new age for the entire world. The way that the world had been organized for half a century no longer applied because this dividing line between East and West had been removed. The collapse of the Berlin Wall, however, illustrated the fact that breaking down barriers is a complicated enterprise. The tearing down of the Berlin Wall raised some very difficult questions. The simplest of all was this: now that this impassable boundary had been erased, what exactly were we supposed to do? The symbol of our hostility had been removed, but what had happened to the actual hostility? Moreover, the wall instructed us about who we could and could not trust; the collapse of the wall meant that the world was far more uncertain. November of 1989 was a seminal moment in international politics, because it was not only the inauguration of a new world order, but it also left us wondering what that new world order would look like. In other words, we were all left wondering how the world had changed in the face of this wall collapsing. The writer of Ephesians understood the complexity of breaking down barriers and tearing down walls. Just as the Berlin Wall and Iron Curtain divided the 20th century world, the ancient world was split by a similarly impassable boundary. For those people who were children of Israel (who became known as “Jews” in the Roman Empire, since most of them lived in the province of Judea), there was a distinct and virtually impenetrable dividing line between Jew and Gentile, between Israel and “the nations,” between the people of the covenant and everybody else. It’s important to remember that no one fell outside of this distinction. It wasn’t as though there were Jews, and then there were Gentiles, and then there was a group of people yet to be defined. If you were a Jew, you were not a Gentile; if you were a Gentile, you were certainly not a Jew. This dividing line was occasionally traversed, but these instances were rare and the Gentile converts were, for the most part, not regarded as true members of Israel. For the people of Israel, in other words, there was a clear, bright line that divided the world: a wall between those whose ancestors had made covenants with God and those who had not. For the earliest Christians, this was a perfectly reasonable way to view the world. It was clear to them that a division had existed between Israel and the nations, between Jew and Gentile. It was also clear to many of them, however, that through his death and resurrection, Jesus Christ had torn down the wall that separated Jew and Gentile, that he had erased the boundary that divided the world for so long. For these early Christians, the promises of God were no longer limited to the children of Israel, but were now accessible to everyone. Jesus Christ had broken down the dividing wall that separated humanity, erasing the ancient hostility between Jew and Gentile and making both groups into one. 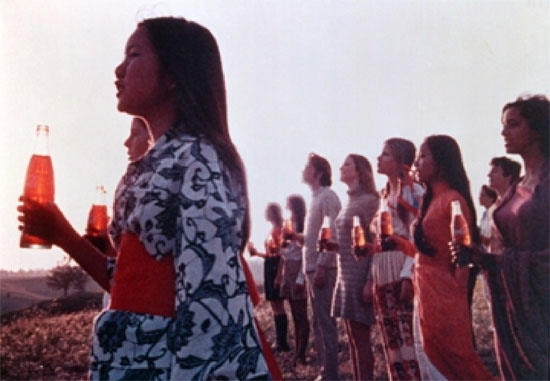 It’s this incredibly beautiful image of harmonious unity; it might seem like the biblical equivalent of that Coca-Cola commercial from the 1970s, where the nations of the world are gathered together on a mountaintop in Italy, singing about how they’d like to “buy the world a Coke.” This image, however, is too simplistic. It’s one thing to say that Christ has erased the boundaries between Jew and Gentile; it’s quite another to explain why. How did the world change in such a way that the wall could come down? What did the death and resurrection of Jesus Christ do to unite Israel and the nations? The writer of Ephesians has a somewhat surprising answer, suggesting that Christ came to abolish the Law with its commandments and ordinances. The reason that this is so surprising is that the Law represented Israel’s relationship to God. Jews could point to the Law and say: “this is a symbol of our covenant with God; this is how we order our lives to show God’s claim on us.” So to say that Jesus Christ abolished the Law is an affront to Israel’s very identity. Moreover, the Law was the way that Israel was reconciled to God; it was the way that Jews were assured that God would forgive their sins. But the author of our passage argues that Christ reconciled both Jews and Gentiles to God in one body through the cross. In other words, the writer puts Jews and Gentiles on the same plane, suggesting that they were equally sinful, in equal need of reconciliation, even though Israel had the Law, which is what they thought was their means of reconciliation! Our passage makes the extraordinary and radical implication that Jews and Gentiles are not different, that they are in equal need of God’s mercy, and that they are equally deserving of God’s grace. This is an astonishing claim, but it explains why Christ could demolish the wall that separated Jew and Gentile: ultimately, their differences are insignificant. The wall was a human construction and it needed to be taken down. Jew and Gentile are one in Christ Jesus: no longer are they strangers to one another, but they are citizens and saints, equal members of the household of God. This leaves us with a significant question, one that has implications for us today. If Christ has torn down the wall that separates us because our differences are insignificant, does that mean that we are all supposed to be the same? The early Church wrestled with this question. There were some who argued that Gentiles who became Christians first had to become Jewish: they had to be circumcised and they had to keep kosher, observing the Jewish food laws and holy days. There were others who said that Christians were not allowed to keep kosher; that they had to give up these food laws and stop observing the traditional Jewish feasts. Ultimately, instead of picking sides, the Church decided to accept a range of diverse theologies and practices. Gentile converts weren’t required to become Jewish, and Jewish Christians weren’t required to give up their Jewish heritage. The early Church decided that Christian unity was not about what one looked like, or what foods one ate, or how one prayed, or anything like that. For the early Church, unity was about what God had done through Jesus Christ. Erasing boundaries and tearing down walls did not negate the differences between church members; it made it so that these differences could no longer be a cause of division. The death and resurrection of Jesus Christ did not just tear down the walls that existed between Jew and Gentile. This was simply the ultimate division in the ancient world; it was the most dramatic distinction that divided human beings. Since Christ has nullified that division, therefore, he has also nullified every other division that exists in this world. We need to understand that the walls that we imagine still divide us have been torn down through God’s action in Jesus Christ. And I’m talking about divisions that we accept as utterly normative in our society. Divisions between conservative and liberal, Democrat and Republican, rich and poor, North and South, urban and rural, blue and white collar, educated and experienced, Longhorn and Aggie; we imagine that there is a crowbar separation between these groups, but that is a denial of the reality that Christ has ended the hostility that exists between us. This is not to say that our differences in ideology or background are unimportant, but they cannot be a cause for division or separation. Too often our disagreements become destructive simply because we allow them to, because we forget that our unity is in Christ. And when we talk about Christian unity, we are not saying that we all agree about everything; we talk about Christian unity because through Christ we have all been reconciled to God. We must affirm that the walls that separate us have been demolished and we must acknowledge that we are all in equal need of God’s mercy and we are all equally deserving of God’s grace. And ultimately, the fact that the walls have been taken down is not as important as the fact that we all have been made one in Christ. The wall has come down; the world has changed forever: how will we allow that fact to change your relationships with the people in your community, in this nation, and in the world? In other words, will you allow the walls in your life to be torn down and change you forever? Sermon on Mark 6:1-13 offered to the people of the Church of the Heavenly Rest on Sunday, July 8, 2012. Every year around Christmastime, a little melodrama plays out among students returning home from their first semesters at college. Young men and women who have been away from their hometowns, some for the very first time, have spent four months learning new things, encountering new people, and having brand new experiences. So when they come home for the holidays, they are very aware of their personal growth. For some, this growth may be represented in a new academic intensity: perhaps they discovered the works of Hegel in Philosophy 101 and insist on explaining to everyone how the world can be viewed through the lens of dialectics. For others, their newfound expertise is physical: people who had been gangly and awkward in high school have grown into their bodies and become varsity athletes. Still others have become expert socialites, regaling anyone who will listen with tales of partying at every college in town and staying out until the sun rose. The melodrama takes place when a group of these people who had been friendly in high school decide to get together and reconnect. These young people had promised to stay in touch while they were at school but never seemed to be able to pick up the phone. And now, this get-together is a little bit of a chore, but nevertheless all of them decide to go, not necessarily because they want to see their old friends, but because they want to show them how much they’ve grown and changed. They want their old friends to be impressed with their new academic, athletic, or social prowess. They expect that their old friends will be amazed by the changes that have happened in their lives. But when they get together, they are so distracted by trying to show off, so distracted by trying to make deep philosophical points or flexing their muscles or relating anecdotes for which you simply had to be there that they forget to interact with one another. Everyone, in other words, is so distracted by the changes in their own lives that no one notices that anyone else has changed. These young people are so inwardly focused that they forget that everyone experiences change in their lives. The melodrama concludes when these young men and women return to their parents’ houses and come to the same melancholy conclusion: you can’t go home again. It might seem that this is the dynamic that pervades today’s gospel reading. It might seem that Jesus is simply wrestling with the challenge of returning home after beginning a new venture in his life. At the beginning of this passage, Jesus is riding high. In the previous chapter, Jesus was on a roll: not only had he defeated a legion of demons, he healed a woman who had been sick for twelve years and he raised a little girl from the dead. When he arrives in Nazareth, then, he and his disciples must be thinking that he can do no wrong. Moreover, quite apart from his talents as a healer and exorcist, this is his hometown: imagine the reception that he will receive once he arrives. This hometown boy has put Nazareth on the map! Everyone knows who he is and everyone is clamoring to know where he comes from. At first, his reception in Nazareth is extraordinarily positive. Jesus begins to teach in the synagogue, as he often does on the Sabbath, and the people listening, his neighbors whom he grew up with, are astonished by his words. Though their reaction can be read in a biting, sarcastic tone, the fact that they use such positive words makes me think that the crowd is just being effusive: “Where did he get all this?! Listen to his wisdom; look at the deeds of power he’s been doing! This is little Jesus, the carpenter! His mom and his brothers and sisters are right here with us! What a great testament to his family and to our hometown values that he has become such a success!” But for all of that effusiveness, for all of that excitement, the crowd very quickly turns against Jesus. Our translation says that they took offense at him, but it’s more accurate to say that they were scandalized by Jesus. Very suddenly, in other words, Jesus goes from hometown hero to persona non grata. And at first, he is surprisingly stoical about the whole situation, reflecting that, “prophets are not without honor, except in their hometown and among their own families.” More striking is the fact that because of their refusal to accept him, because of the fact that Jesus had scandalized his family and neighbors, he was unable to do any deeds of power. Jesus, who in Mark’s gospel reveals the royal power of God through his miraculous healings and exorcisms, was unable to do anything because his own people had rejected him. It’s at this point that, in spite of his initial philosophical response to his rejection, Jesus becomes emotional, even a little melodramatic; Mark tells us that Jesus was amazed at their unbelief. After hearing this very brief story, we’re left wondering why the people of Jesus’ hometown rejected him. Why did the people in Nazareth go from effusively celebrating the wisdom and ministry of Jesus to being scandalized? It almost seems like we’re missing a verse. If this story were told as we might expect, the people in the synagogue would be praising Jesus, Jesus would interrupt them and say something nasty about their mothers, and then they would be scandalized. But we don’t have a record of Jesus saying anything rude. In fact, we don’t have a record of Jesus saying anything at all. At least in Luke’s version of this story, Jesus reads from Isaiah 61, saying “the Spirit of the Lord is upon me, because he has anointed me to bring good news to the poor.” He then claims that “this Scripture has been fulfilled” in the hearing of those in the synagogue. For Luke, in other words, Jesus’ family and neighbors are scandalized because he boldly claimed to fulfill a prophecy about God’s anointed. But in Mark it seems that the very presence of Jesus scandalizes those closest to him. In Mark’s gospel, Jesus is rejected because of who he is, or rather, who he has become: the Messiah of God who is ushering in a new age. Jesus no longer exclusively represents the interests of a backwater village in an obscure province of Roman-occupied Palestine; Jesus now represents the inbreaking of God’s kingdom into this world. Jesus is a testament to the fact that the status quo is no longer acceptable or even relevant, that God is transforming the world in a radical new way. The people of Nazareth were happy to praise a young man full of promise who would operate within the power structures of this world; they were not ready to face the reality that through Jesus Christ God has broken into the world and is changing it forever. As disciples of Jesus Christ, as people who have placed the gospel at the center of our lives, we are called to proclaim boldly that God has transformed and is transforming the world through Jesus Christ. And just as our Lord offended his family and friends, this proclamation sometimes requires us to be scandalous. It requires us to question the status quo. It requires us to cry out when the unjust structures of this world trample on those who cannot care for themselves. It requires us to make the transforming power of God’s love known to the world even when it makes us uncomfortable. And it may require us to face rejection by those closest to us, those who may not yet be able or willing to understand that the old age, ruled by sin and death, is passing away, and a new age, ruled by justice and righteousness and faithfulness is being brought into being. If and when we experience this rejection, it is not the end of the road. There’s a wonderful detail in our gospel passage; even after Mark tells us that Jesus “could do no deed of power there,” he goes on to say that Jesus did cure a few sick people. In other words, even when the transformative power of God appeared to hit a significant road block, Jesus still demonstrated that the kingdom of God is breaking into this world even when people refuse to recognize it, even when people push it away. As Christians, we are called not only to realize that God is transforming the world, we are also called to participate in God’s work of transformation. This is not an easy thing to do. We live in an age where the gospel is met with increasing hostility. Fewer and fewer people claim membership in any kind of Christian community. Powerful interests are more concerned with profits and the bottom line than they are with helping those in desperate need. When we look at the world, we might be convinced that it is simply too much for us, that we should retreat into our church buildings and close our eyes to the injustice and the faithlessness we see in the world, pretending that they do not exist. But then, we would be forgetting that God has broken into the world and that the world is being transformed by the gospel of Jesus Christ. This is part of the reason that the vestry of Heavenly Rest has set the goal of having a million dollar budget next year. It’s not so that we can give the staff big raises or buy all sorts of new altar hangings; it’s so that we can give money away. It’s so that we can put our money where our mouth is and affirm that God is changing the world not only in the abstract, but in this very community of Abilene. As Christians, we are called to stand up and proclaim through our words and our actions that God has changed and is changing this world forever, regardless of how that message may be received. Though Jesus was rejected by his hometown, though he suffered the ultimate rejection at the cross, God transformed that rejection through the Resurrection. Through the Resurrection, God affirms that even when our proclamation falls on deaf ears, even when it is being actively opposed, it will still usher in the new age. Even when we are rejected for the sake of the gospel, we are participating in God’s transformation of the world.